It has been a long while since I have updated regarding doctors, health issues, and fertility. Perhaps an update is in store? First of all, I switched to a NaPro doctor back in November. I am kicking myself for not making the switch sooner. I posted before about the need to be your own advocate, and while I have attempted to do so for years, it is hard work and still can take time. Through a long series of events, I was finally able to switch. I highly, highly recommend NaPro Technology to anybody dealing with fertility issues or any issues relating to women’s health and their cycles. NaPro stands for Natural Procreative Technology. It was founded by a Catholic man and because of their beliefs, they do not do any IVF or artificial fertility treatments. And that is why I recommend them….they work only with your body to fix your body’s symptoms, to get to the root of the issue with your body. They won’t band-aid anything with birth control or IVF. I finally was at a place where all my symptoms were taken into consideration, where I wasn’t told “these things just happen,” etc. I was finally at a place where I didn’t have to fight tooth and nail just to be heard. Endometriosis, low progesterone, and MTHFR can all cause miscarriage. My Dr told me that 50% of pregnancies end in miscarriage with even small amounts of endometriosis present. And the reason it usually takes us a while to get pregnant is because of the LUF. All the pieces started falling into place! To treat the endo, I had a surgery in March where all the endo was removed. To restore hormonal balance for the endo, PCOS, low progesterone, and the LUFs, I was instructed to give myself HCG injections post-peak (after ovulation). If I did not ovulate due to an LUF, I instead went in for progesterone injections. All hormone injections are bio-identical hormones. To diagnose the thyroid disorder, I took my basal body temperature 4 times a day for a while. People with this disorder tend to have low body temperatures. Mine certainly were! I also had a large number of symptoms on a symptom checklist they gave me. After diagnosis, they gave me a prescription for T3, which is one of the thyroid hormones, and the part that affects the adrenals. They started me on the lowest dose and slowly worked me up two doses to the highest dose, or therapeutic dose. Within one week of being on the low dose, I was sleeping almost completely through the night. This might not sound like a huge deal, but after over ten years of awful awful sleep issues, this was truly incredible. Not only did I sleep better, but I noticed a marked improvement in my irritability. Now, this could be because lack of sleep is tied to irritability…or it could be because irritability is another symptom of TSD. Regardless of the reason, I was over the moon happy. I went from feeling almost constantly on edge, irritable over the slightest things, and feeling completely out of control of my frustration levels…to suddenly being able to notice triggers….to being able to feel irritation rising up in me…and in turn being able to work through it before it came out (or be able to more quickly calm down and then work through it and apologize). After years and years of feeling like an awful sinful person and doubting my salvation over my continued struggle with frustration and anger, it was so shocking and wonderful to realize that it was not just a spiritual problem. It was a physical one. My body was so over-worked and could not function the way it was supposed to. Yes, my sinful flesh still struggles with getting frustrated easily. But now that the physical part is more under control, I am now a lot happier, and more easily able to A) notice frustration levels rising (instead of feeling already almost constantly at the edge) so that B) I can work through it. When I finally got up to the highest dose of the T3, within one week, I again just felt better. I can’t pinpoint any specific symptom that improved, I just felt better. Not sure how to explain it. Now, for the MTHFR, I had to go to another doctor to be diagnosed. My NaPro doctor would not test me for it (not all NaPro doctors refuse, but mine did). Thankfully, I had another great recommendation for a doctor, so I went to her. She explained to me what MTHFR is, why it is underdiagnosed, and the science behind it. After being tested, I did indeed have a form of MTHFR, which is basically a genetic mutation where your body cannot process folic acid. To treat that, I went on MethylCpG. Because it is a genetic mutation, it cannot be cured, only managed to help my body better deal with the mutation. MethylCpG is, in essence, a methylfolate supplement. After hearing several glowing reports of people feeling night and day better after only a few days on a folate supplement, I tried to not get my hopes up too high in case I didn’t have as dramatic a story. Well…I did. Within 3 days, I noticed major change and improvement. I felt like a weight was lifted off me. I felt happy. As in…happy. It has been a very very long time since I felt with my emotions that I was happy. I noticed a big change in my depression with that. Also big changes in my anxiety. A lot of things just didn’t bother me anymore. I was less stressed and less worried. For years I had felt as if I lived in a thick fog, kind of “floating” through life. As soon as events would happen, it often felt like it was already in the distant past. I felt disconnected from my surroundings and from events. While I do still experience that, I did notice improvement in the brain fog and in the disconnected feeling. I also noticed improvement in my energy levels and motivation to accomplish things. Who knew that something as simple as folic acid could affect so much?? The hormone progress was much slower. For several months it seemed like nothing was happening. I kept having LUFs, and regardless of treatment, I could not get my body to ovulate. But I did notice smaller changes, such as cycle length and improvement on issues relating to my period. Even though there were several discouraging things, such as not actually ovulating, I knew that my body was responding to the hormones. It just takes time to fix things that have been out of whack for so long! I again highly highly recommend NaPro. Especially if you are feeling like your voice is not being heard or your symptoms are being dismissed. To find a NaPro doctor near you, check this map. One thing I appreciate about my NaPro doctor is that she was very thorough in diagnosis. She did a full blood panel and a full ultrasound series. One problem with mainstream doctors is that they will do a blood test for hormone levels on one day…but the problem is that your hormone levels change throughout your cycle. Levels on one day do not give an adequate representation of your overall hormone levels or if they are in balance. In addition, if a doctor orders an ultrasound, it is usually on one or two days of the cycle. If my Dr hadn’t followed me through with a full series (at one point I was getting daily ultrasounds), we would not have known that I have LUFS. If I had simply had one ultrasound that showed a growing dominant follicle, most Drs would have told me I was good to go and would never have realized that a week later, my follicle was still growing…and growing…and never released. So there is a brief update. I feel so strongly that people be with doctors that will truly help their case and help heal their bodies….with no band-aids, no fights, and no immediate jumping to more extreme methods. I am so incredibly thankful that God led us to this Dr and that I finally got answers. For the longest time when I thought about how much better I felt, I would seriously start crying. I was beginning to think that I just had to learn to live with feeling awful. I can’t even describe how much better I feel now. I had the privilege of writing my first guest post for a fellow blogger. The Rosevine Cottage Girls were doing a series on how to trust and follow God when your dreams are changed or taken away. I immediately thought of our dreams for a large family. The path God has taken us down looks nothing like the dream I had for years. It was (and is) a challenge to trust God with the new dreams He is bringing to us. So here are a few thoughts from me about what to do when God changes your dream. December 22, 2011. I put on the most beautiful white gown and walked down the aisle to say “I do” to the man of my dreams. We were so happy that day. So insanely happy. Since before we were married, my husband and I had thought that we would like about six children. We agreed that we would take it one child at a time, making sure that we were doing a good job parenting as unto the Lord before adding another child. But we thought the end result would probably be us having about six children. After marriage, we moved into a 250 square foot apartment. It was tiny, but cozy and perfect for our first love nest. A baby would make it tight, but we knew we could do it for a few months until we moved out. The months started to pass. We weren’t preventing pregnancy, so every month made me a bit more confused and discouraged as another negative pregnancy test greeted me. Visit The Rosevine Cottage Girls to read the whole post. If you have been in the TTC world long, you have probably heard about fertility smoothies. For the longest time, I put it off, because it seemed so overwhelming. And annoying to have to make a big old smoothie every day. Well, a few months ago I joined a TTC accountability group and one of the first things the leader wanted us to do was to make a daily smoothie. I finally took a deep breath and bit the bullet. Lo and behold it wasn’t that complicated, and some (most!) of the smoothies tasted great! Life happened and I stopped making them daily, but my goal is to get back to daily or at least every other day. Fertility smoothies are a great way to infuse your body with foods and boosters that will aid fertility. First of all, I want to talk a bit about some of the ingredients I’ve been using and how they relate to fertility. Then I will include a few of the recipes I have tried. Kale. Kale is an amazing source of iron, calcium, vitamin C, folate, antioxidants, potassium, etc. Kale can help alkalize your body, which is important in a culture where our diet is so acidic. Spinach. Spinach is another one that is full of antioxidants, iron, folate, zinc, and iron. Celery. This is another one that helps to alkalize your body. Eating foods like this will help to balance your body’s pH. Flaxseeds. Rich in Omega-3! Flaxseeds can help balance hormones as well as cleanse the colon. Chia seeds. Another great source of those necessary fatty acids. Omega-3 can help balance hormones, increase cervical fluid, aid ovulation, and increase blood flow to the uterus. Berries. Again, lots of antioxidants. Antioxidants are great for egg health, as well as keeping reproductive tissue healthy. Those are just a few of the things you can include in your smoothies. If you would like more ideas, I highly recommend Natural Fertility Info. Here is a list of items you can include as well as a 10 Day Smoothie Challenge that they have put together. So here are a few “recipes” that I have used. Honestly, they aren’t even recipes. I usually just look to see what I have in my refrigerator and freezer, and throw stuff in the blender. Only a couple have turned out badly (don’t worry, I didn’t include those 😉 ). There are lots of ideas on Pinterest as well for fertility smoothies. It is a great way to get super foods and fertility-friendly foods into your day! Have you ever made a fertility smoothie? What did you put in it? I wanted to take a quick second to let you all know about this fantastic upcoming resource for those who are TTC. The Fertility, Pregnancy, and Birth Summit will have a ton of experts speaking on all things related to trying to conceive. I first heard of the summit from Heathir from Natural Fertility Info. She is one of the speakers. If you’ve never heard her speak, you need to!! She is an amazing wealth of information. In addition to Heathir, there are thirty (yes, thirty!!) other experts who will be sharing. The summit will begin on February 1. And it is FREE!!! (From the promo video, it also sounds like there will be giveaways! Yay! 😉 ) Sign up here. I don’t get anything from sharing this….I just wanted to make sure I am spreading the news so that as many people as possible can gain from this awesome event. I also want to add that it is so so important to take care of yourself if you are experiencing a miscarriage. With my first miscarriage, I hardly ate and I only took one supplement one time. I was so exhausted, dizzy, and weak. With my second one, I ate and took my Iron and Vitamin C supplements. Such a huge difference! Even though the second miscarriage was somewhat harder physically, the recovery was much easier. After my first miscarriage, I found some of these pages. I sobbed as I looked through some of their beautiful images. Check out Small Bird Studio. While they are not exclusively for remembrance items, they do have some beautiful shirts, mugs, journals, prints, phone cases, etc. Please add to the list in the comments! Note: Life With You is a participant in the Amazon Services LLC Associates Program, an affiliate advertising program designed to provide a means for sites to earn advertising fees by advertising and linking to amazon.com. 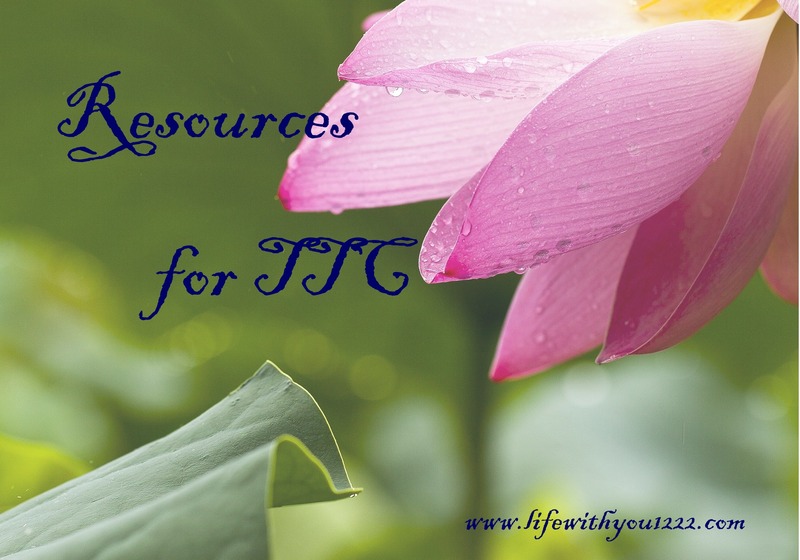 Here is a list of resources that I have compiled about trying to conceive. I hope that it is encouraging to you! Natural Fertility Info. She has had some great Scopes recently that have been very helpful. You can also follow me if you would like. I am EasyGreenClean on Pericope. I don’t Scope regularly but my goal is to cover a variety of topics, including TTC. Feel free to add any other resources in the comments!